If you're a San Francisco taxi driver and have been ticketed by the City and County of San Francisco on the job, the following is from the San Francisco Municipal Transportation Agency (SFMTA). "We are advised by our Enforcement staff that if you encounter a particular Parking Control Officer who seems to be acting unreasonably, that it is important to communicate that information to us at the SFMTA, INCLUDING that person’s badge number or the citation number and the reason why you consider the person’s behavior to be unreasonable. With this information we can follow up with particular PCOs with counseling when necessary. Please try to limit your complaints to citations that are clearly unjustified and we will work with you to reduce the incidents of such citations.Thank you." 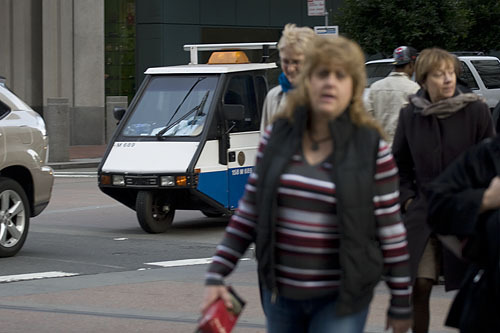 CLICK HERE to view downloadable and printable PDFs provided by the SFMTA, instructing police officers not to cite taxi drivers who are loading and unloading customers in bus zones, etc. The dates of the bulletins range from 1994-2005.